It is sometimes determined that a patient is not a candidate for LASIK, due to thin corneas or extreme nearsightedness. Fortunately, there are now other options we can offer these patients. 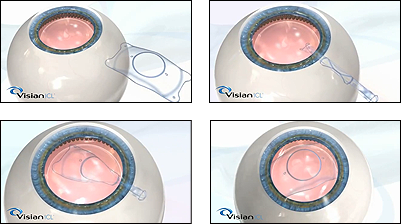 One option is the Visian Implantable Contact Lens. More than 300,000 people worldwide enjoy superior vision with the Visian® Implantable Contact Lens. Another option is PRK or Surface LASIK. A third option is Refractive Lens Exchange. Read below for more information on these alternatives. Have dry eyes, severe myopia (nearsightedness), or a thin cornea (non-LASIK candidate). You have no other eye disease. You wish to reduce or eliminate the need for glasses or contact lenses. A special contact lens that is permanently implanted inside the eye on an out-patient basis. Crafted from Collamer®, an advanced biocompatible material that is 100% collagen and completely safe. The Visian® lens is removable and replaceable will no ill effects. This lens does not change the corneal surface at all, whereas LASIK does. Patients who are nearsighted and have been told they are not a LASIK candidate, can enjoy the same end result. You have thin corneas (non-LASIK candidate). You are a LASIK candidate but do not want to have a flap. In LASIK, a flap is created followed by laser to remove or reduce dependence on glasses or contacts. In PRK, a thin layer of cornea is removed with medication. This layer is much thinner than a flap. The same laser used in LASIK is used to remove/reduce dependency on glasses or contact lenses. The final results are the same as LASIK, but recovery time is slightly longer. Those who may not be LASIK candidates still have an option to become glasses free. No flap is created, thus eliminating any rare complications associated with it ( i.e. wrinkles, dislodging). You are not a candidate for LASIK or ICL. You are extremely hyperopic (farsighted). The natural clear lens of the eye is removed and replaced with a lens implant. This implant has the perfect focusing power for your eyes. A laser can be used for this procedure to ensure the best visual outcome. Patients who are farsighted and have been told they are not a LASIK candidate, can enjoy the same end result.